With WebcamMax, you can add videos, pictures and effects to virtual/real webcam for your live video chats or live streaming. It works on all webcam programs and thousands of effects are available. You can record videos with our cool effects and upload directly to YouTube or your Blog. You can show videos, pictures, or your desktop screen to others. It enables Doodling and the PinP feature enables you to show different sources at the same time. You can snap the picture of video box as well as record videos with our cool effects and broadcast them on YouTube or your Blog. You can also do slideshows, share your screen with friends, play movies for them or trick them with a fake video. 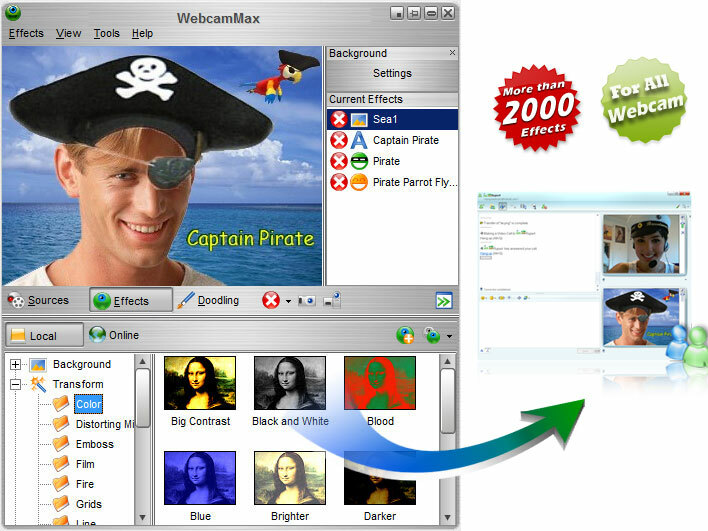 WebcamMax enables PinP of which Webcam, Screen, Movie or Picture can be selected as source. WebcamMax enables Doodling as well and you can paint on the video box directly. * Thousands of Fantastic Effects - Thousands of cool effects for your live video chats and video recording. * Virtual Webcam - Share your video clips or desktop screen with family and friends through your Instant Messengers even without a real webcam. * Easy to Share - Directly share your video with family or friends on youtube.com. Qweas is providing links to WebcamMax 7.6.5.2 as a courtesy, and makes no representations regarding WebcamMax or any other applications or any information related thereto. Any questions, complaints or claims regarding this application WebcamMax 7.6.5.2 must be directed to the appropriate software vendor. You may click the publisher link of WebcamMax on the top of this page to get more details about the vendor.